Last updated Wednesday, 5 June 2013 at 19:49:11. First submitted Wednesday, 5 June 2013 at 19:48:03 by Derek E Sibson. 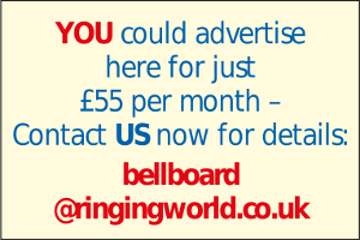 Sent for publication in The Ringing World on Wednesday, 5 June 2013 at 19:51:58, and printed in issue 5330, page 629.